Italian physicist, born at Parma on the 11th of April 1798. 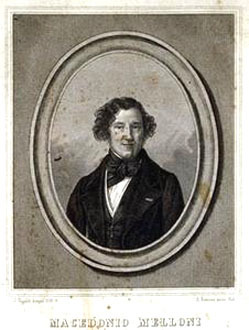 From 1824 to 1831 he was professor at Parma, but in the latter year he was compelled to escape to France, having taken part in the revolution. In 1839 he went to Naples and was soon appointed director of the Vesuvius observatory, a post which he held until 1848. Melloni received the Rumford medal of the Royal Society in 1834. In 1835 he was elected correspondent of the Paris Academy, and in 1839 a foreign member of the Royal Society. He died at Portici near Naples of cholera on the 11th of August 1854. Melloni's reputation as a physicist rests especially on his discoveries in radiant heat, made with the aid of the thermomultiplier or combination of thermopile and galvanometer, which, soon after the discovery of thermoelectricity by T. J. Seebeck, was employed by him jointly with L. Nobili in 1831. His experiments were especially concerned with the power of transmitting dark heat possessed by various substances and with the changes produced in the heat rays by passage through different materials. Substances which were comparatively transparent to heat he designated by the adjective "diathermane", the property being "diathermaneite", while for the heat-tint or heat-coloration produced by passage through different materials he coined the word "diathermansie." In English, however, the terms were not well understood, and "diathermancy" was generally used as the equivalent of "diathermaneite." In consequence Melloni about 1841 began to use "diathermique" in place of "diathermane", "diathermasie" in place of "diathermaneite", and "thermocrose" for "diathermansie." It remains very confusing. His most important book, La thermocrose au la coloration calorifique (vol. I, Naples, 1850), was unfinished at his death. He studied the reflection and polarization of radiant heat, the magnetism of rocks, electrostatic induction, daguerrotypy, etc.